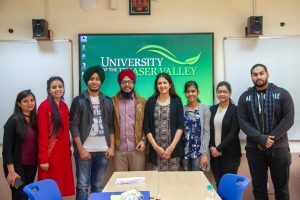 UFV India recently launched the Supported Learning Groups Program (SLG) at the Chandigarh campus. 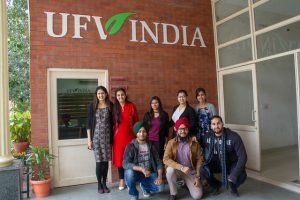 The initiative was led by Navneet Sidhu, the Coordinator for the SLG program at UFV, who visited UFV Chandigarh to train the staff, faculty and students. SLGs are peer led study sessions aimed to improve study skills and grades in first year courses and usually based on the courses which have high failure rates and are considered academically difficult. UFV Chandigarh hired 4 student leaders to support 2 courses-COMP 150 and MATH 141. The courses were selected are based on the level of difficulty that students find them to be. SLG leaders are students who have taken the courses in the past and excelled in them. UFV Chandigarh will begin implementation of SLG support in the summer semester. Leaders will hold 2 sessions each week where students taking these courses will be welcome to attend for extra help in the courses. Sharing her experience training at the Chandigarh campus, Ms. Sidhu said that “Students, staff as well as the faculty were very excited to learn about the SLG model. They were all very actively engaged throughout the 4 training days.” She said that this has been a very memorable and exciting experience and thanked Satwinder Bains, Director SASI for funding the trip and training and to Maureen Wideman, VP Teaching and Learning for encouraging her to go and help the India campus start up with the program.